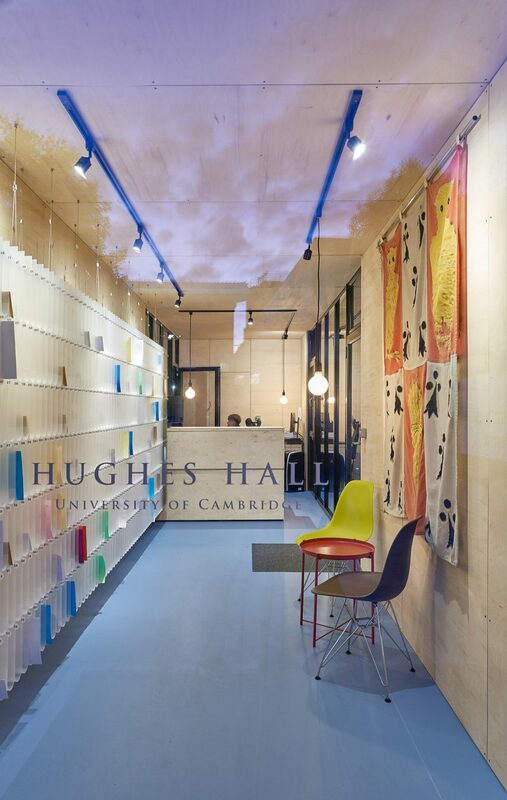 Cambridge University college Hughes Hall has a new reception building – a converted shipping container designed by local studio Neubau. 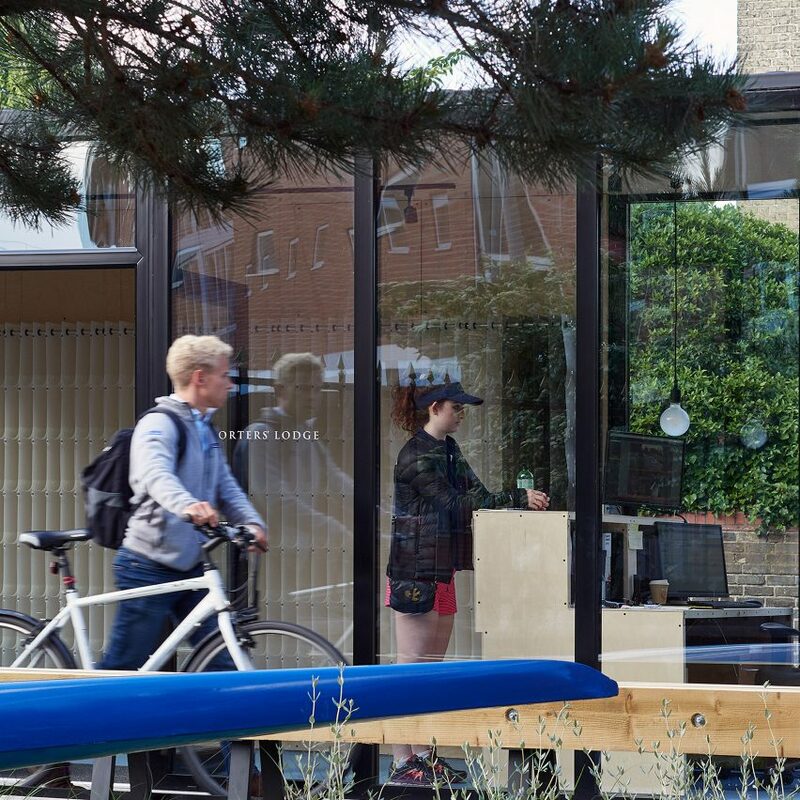 Neubau designed the structure to function as a porters’ lodge for Hughes Hall, providing a reception for visitors, an office for porters and pigeonholes for students. Before now, it was the only college at the English university without one. The project was initiated after the number of porters at the college increased. It replaces a booth located within the college’s dining block. The college needed the porters’ lodge built quickly, but it had to be appropriate for its setting at the entrance to the college, alongside a Grade-II listed building. The architects proposing a container for both practical and aesthetic reasons, as opposed to the original suggestion for a Portakabin. 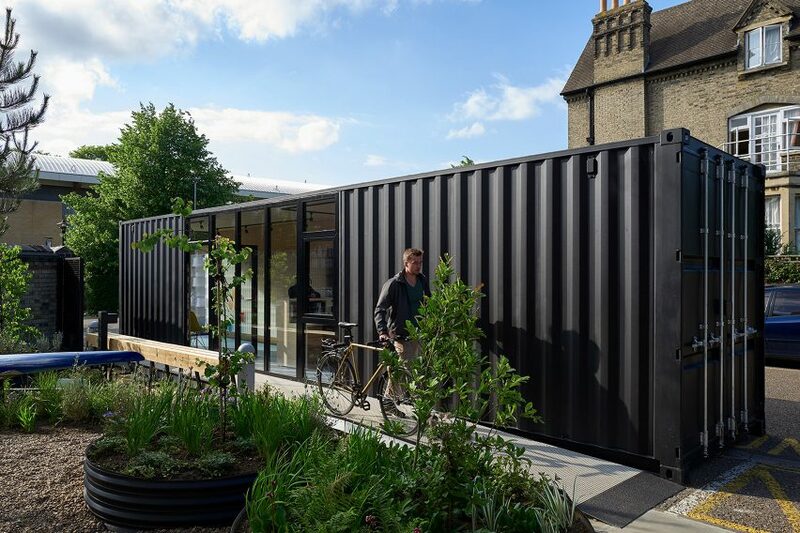 “A shipping container is a ready made self-supporting structure that doesn’t require any foundations and is easily customisable to allow for bespoke design,” Alexander Giarlis, co-founder of Neubau told Dezeen. The lodge, which has planning permission to remain for five years, is situated between the pedestrian and vehicle access at the college’s gate, alongside a new landscaped garden area. 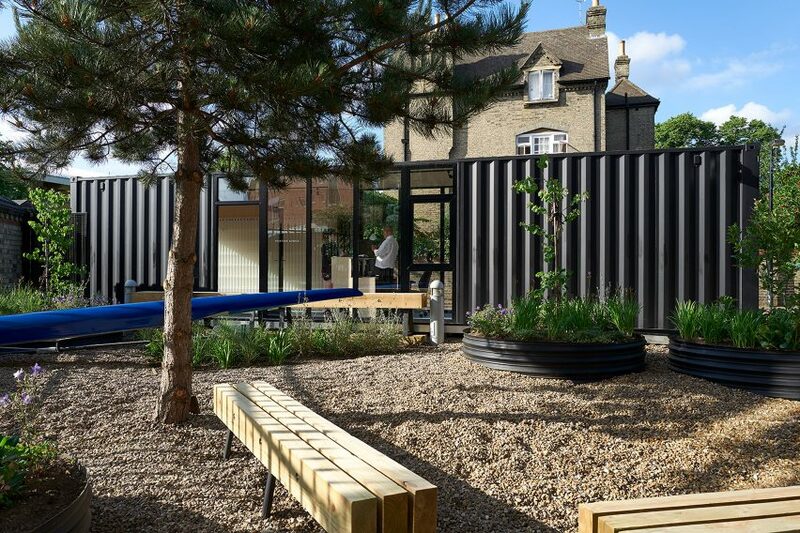 “The standard width and length of a container were a perfect match for the site, a row of three underused parking spaces, and providing just the right amount of area for a reception space, student pigeonholes, a porters’ office and parcel storage,” continued Giarlis. Internally the container is divided into three areas to accommodate the functions that were previously spread around the college. 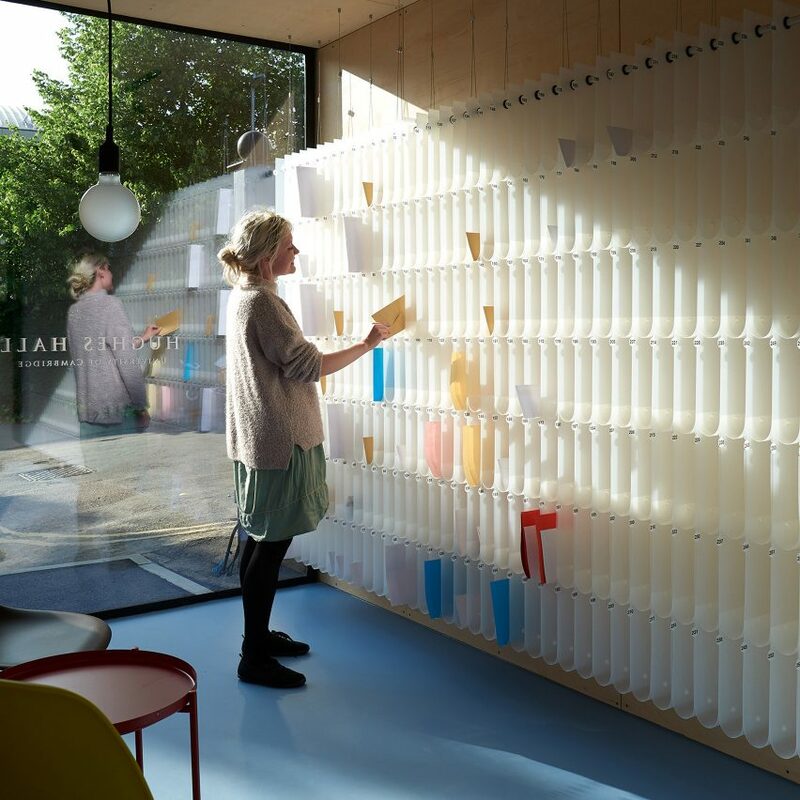 A reception area at the front of the building, which is visible through a full-height double glazed unit at the containers end, contains 476 pigeonholes for students to collect letters. Covering an entire wall of the reception, this storage structure was designed and fabricated by the architects. The office for the porters is in the centre of the building in a space that has windows on either side, to allow the staff to control and direct passing traffic – pedestrians on one side and cars on the other. The parcel and storage area, which can be accessed using the container’s original large doors, is at the rear of the building. The structure is insulated and lined with birch plywood, while the floor is covered with blue vinyl – Hughes Hall’s colour. “Our approach was to integrate the structure in the functionality and aesthetics of the black painted steel of the main entrance gates and railings, said Giarlis. “At the same time we tried to promote the elegance that a steel structure like this can afford, as in the case of the front elevation, which has been opened up to create a simple black steel frame around the view of the first interior of the college that a visitor encounters,” he added. Shipping containers are still a popular choice for temporary and permanent structures. In Ohio, JBAD made a booth for a parking attendant from a container turned vertically, while Fenwick Iribarren Architects has proposed using the structures to construct a stadium at the 2022 FIFA World Cup in Qatar.